The experience of the Games touches everyone – not just sports fans. I didn’t plan to go to Sochi for the Olympics. I’m not so much into sports or watching sports, but after we made a special print supplement about Sochi for the Washington Post and after Vic Wild, who was on the front cover of that issue, won two gold medals for Russia, I became more interested. Then, Meryl Davis and Charlie White, whose Russian choreographer we profiled in the issue, won the gold medal in ice dancing for the first time for the U.S., I became super exited. Plus, with all the negative and ridiculous information in the media about unfinished hotels, double toilets, disappearing stray dogs, terrorists and mistakes in menu translations, I just wanted to check everything out myself. 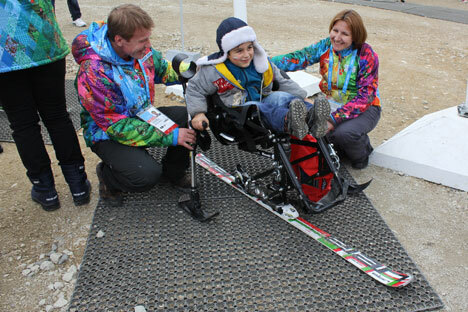 Then, after two of my American friends went to Sochi, I also felt that we Russians are sometimes too lazy to explore our own country, so I decided to go to the Paralympics. I bought a ticket to a skiing competition online for just 400 rubles (12$) and plane tickets for 7000 rubles (200$). Fortunately, I was able to stay at the house of a colleague who contributes photos to RBTH. I got my spectator pass in Moscow, which was very wise, since it saved me time and money. Also, having it let me use Olympic transport straight from the airport. Still, on the first day I still spent more than two hours in a line for tickets to the Olympic Park at the Coastal Cluster, but I think it was worth it. I enjoyed the brand-new sports complexes, affordable food and several stages where groups (mostly folk collectives) from all over Russia were playing, but the most important thing for me were the happy people all over the park. Children were taking part in art contests; teenagers were trying to take a photo in such a way that the Olympic flame was coming out of their mouths; and volunteers were smiling and asking the crowd if they were in a good mood today. My second day in Sochi, I went to the Mountain Cluster by the express train. I went to the Sochi railway train station at 8 a.m., and the line was already 20 minutes long. I wasn’t surprised, though, because it was Sunday on a holiday weekend. I wanted to sleep, but when I saw the sea from the window of the train, it made one of the brightest impressions of the whole trip. So after the free train, bus and a long cable-car ride, I was almost in time for the competitions, which started at 10 am. In the beginning, I didn’t understand why the screen with results for men’s super G had so many names - each result listed two persons. Then I understood that the race was for visually impaired sportsmen and everyone was skiing with the guide, who was giving suggestions and directions. That was why spectators were asked by both the commentators and signs on the screens to be quiet in the last period. The spectators followed the rules and after every finish, gave a round of applause to everyone! The next part was men’s standing super G. It was extremely interesting to see how athletes could go downhill at a speed of about 60 mph on just one foot or without ski poles. Unfortunately many sportsmen fell, especially at one dangerous section, but all of them were rewarded with applause in the end. The most active group of fans were from Austria. They were there to support Marcus Zalcher, who was born with the right side of his body paralyzed. They had many flags, and even wrote “Go Marcus” on sheets of paper. In the end, he won the gold medal. Sixteen-year-old Russian sportsmen Alexei Bugaev won the bronze. At the end of the competition, Marcus came upstairs to meet his family and supporters, and Russian spectators went crazy over him. They recognized him, asked for 50 photos, asked him to sign their tickets, congratulated him in Russian, and congratulated his mother, who was next to him. Marcus was happy and smiled a lot. He said yes to everyone, and didn’t expect such warm reaction. In the end a volunteer had to ask us to leave the athletes alone. At the flower ceremony, spectators were screaming the Russian word MO-LOD-SY (great job!) several times, for Japanese, Canadian, American and Austrian athletes. it was very touching, because people did it spontaneously and commentators didn’t ask them to do it. Of course, they also were screaming RO-SI-YA, when Russian sportsmen competed. Standing in the line for a cable car down the mountain wasn’t boring at all because I had the chance to talk to those in the line with me. People were more open than Russians usually are. Two local ladies were happy to hear that I came especially from Moscow and told me that at the first competitions, they enjoyed watching the foreign fans, who were smiling and wearing great costumes. These ladies also shared their experience watching the men’s super G sitting, when athletes use a special device to ski. Outside the stadium, everyone could try and sit in it and volunteers answered all questions regarding it. I would especially like to highlight the volunteers. I had never seen so many young, active, beautiful, cheerful and positive people in such numbers. I remember that our politicians had aimed to show a new face of Russia to the world in Sochi, and for me it’s the faces of all these young people in bright volunteer uniforms. I even met a girl who answered my questions in Russian, although clearly she was a foreigner. I found out that she was British and came to Sochi especially for the Games. There were only few things that disappointed me in the experience: one was prices in the restaurants in Roza Khutor. There was a real lack of ordinary places to eat there. I also saw a lot of construction in the river near where the Rossiya theme park has been built. The park itself will later be used as a hotel complex and concept is really interesting – you can stay in cottages that represent Moscow, Kazan, St. Petersburg - but it was still sad for me to see how the environment was damaged. I remember that in December 2010, when Russia got the right to host the FIFA World Cup in 2018 after an impressive “from my heart” speech by sports minister Valery Mutko, my British colleague was very excited about it. I didn’t completely understand why she was so happy for Russia, but after Sochi, I got it. Such events are full of a great spirit, when people forget about political conflicts and can understand each other even without knowing each other’s language, and smiles are everywhere. Elena Bobrova is the editor for RBTH print editions appearing in the Washington Post and the New York Times.